Feminine living rooms are usually decorated with bright, soft colors along with vibrant pops of pink and purple shades. These rooms usually include shag and silky textures, inspiring and sweet floral patterns and an overall sophisticated decorative palette. These types of living rooms are most likely to reflect an airy, profound and beautiful ambiance with a truly delightful and chic appearance. Feminine decor finds the perfect balance between the aesthetic and the practical while also giving the room a relaxed modern appearance. If you’re in the process of choosing a style for your living room why not think about something a bit more feminine? In this post we’ve gathered a showcase of 11 Feminine inspired living room designs to provide you with some cool ideas. Check them out and enjoy! This shabby chic living room radiates natural perk and superb design. The bright airy feeling is exceptionally beautiful right? 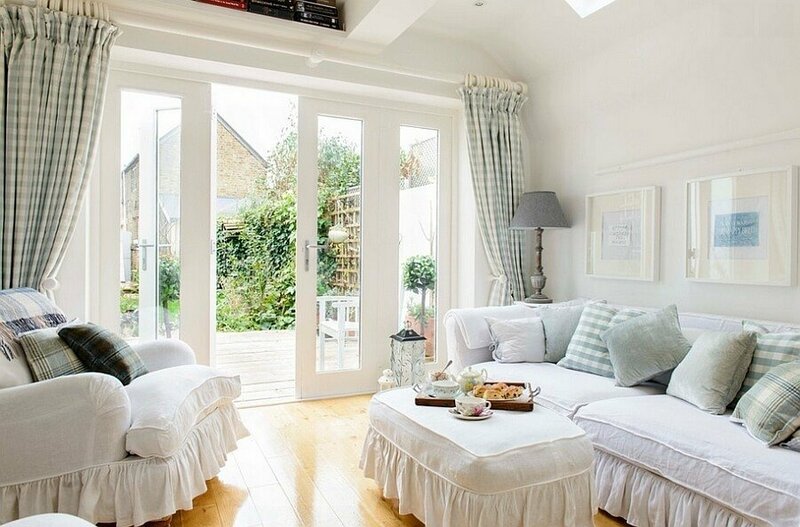 The pastel plaid curtains bring a bit of pattern and country charm, especially when paired with those throw pillows. 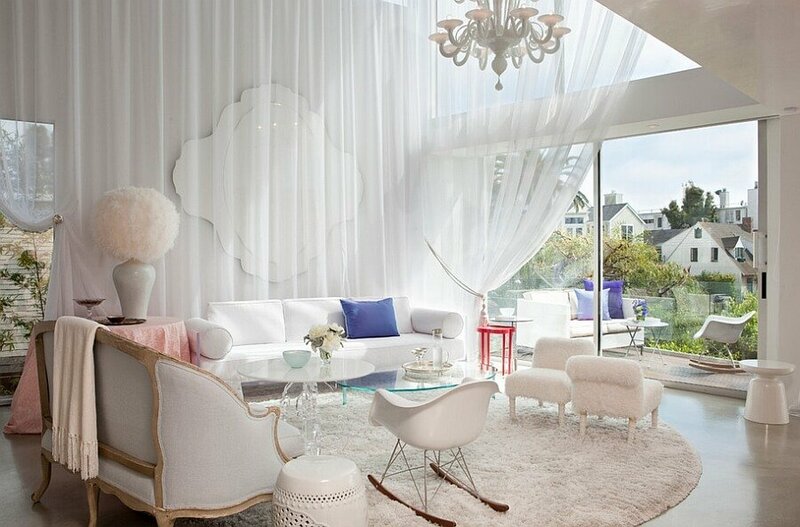 The overall white color of this design contributes to the airy feeling and everything feels soft and feminine. This living room is so chic and splendid! It features a bold blend of chic, contemporary and art-deco styles and applies them all perfectly. The antique sofa, contemporary armchair and the soft shag area rug are all connected by the clean and refreshing white color scheme. 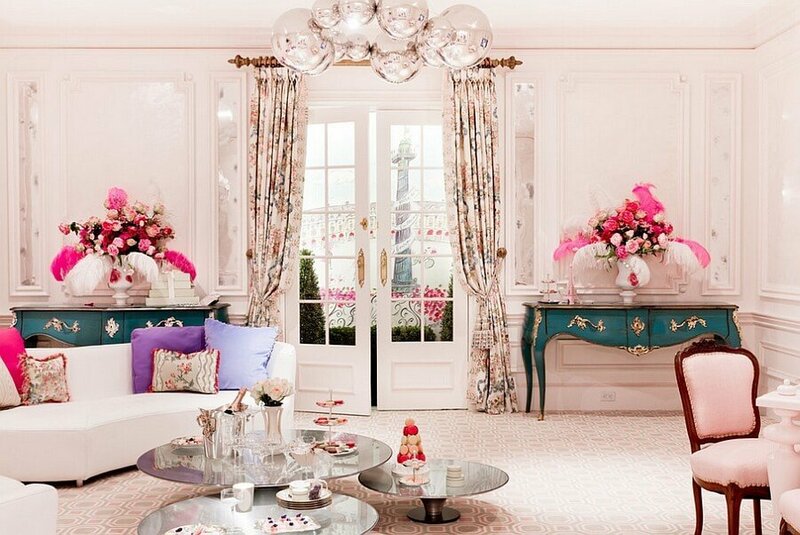 This living room is simply, casual, gorgeous and delightfully feminine. The turquoise wall brings a refreshing vibrancy to the room. It’s perfectly decorated with just the right kinds of accessories and colors. The reclaimed palette coffee table adds a bit of rustic charm as well all the while still remaining feminine. Oh my! All these colours and the splendid decorative palette here is so alluring and inspiring! We love the whimsical setting combined with the exposed brick walls and the wide windows that bring sunlight and brighten everything up. There’s a lot going on in this room yet it doesn’t feel too cluttered and everything is full of chic allure. This living room is sheer serenity. The creamy color scheme is perfectly applied and balanced with striped patterns and shag texture which helps to prevent a dull and monochrome appearance. We love of the pastel blue curtains bring some vibrant shade into this softly feminine space. How perky and chic is this feminine living room? 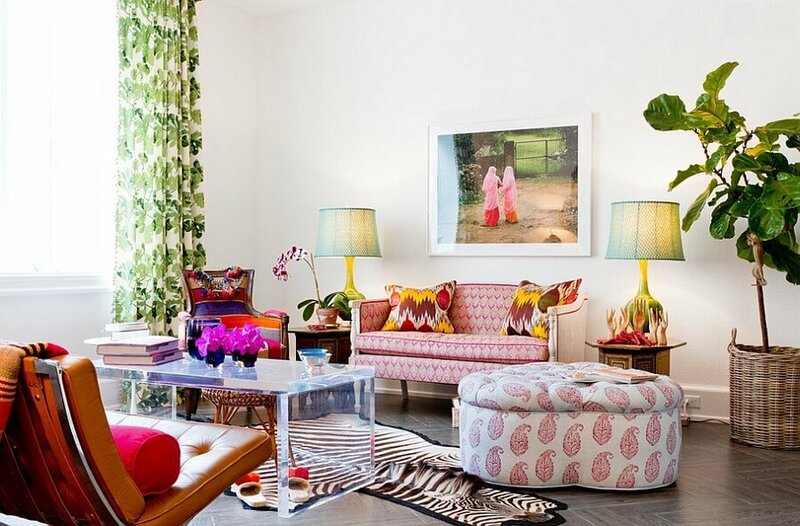 We love the perfect play of color and pattern applied through the striped and chevron throw pillows. Little pops of gold accents contribute to the chic feel and everything feels so lively and cheerful. The purple tufted sofa here makes a bold chic and modern statement, standing out in this white and beautiful living room. The white shag area rug brings some much needed texture and a crisp feel and that very feminine painting on the wall works a s a fantastic focal point. 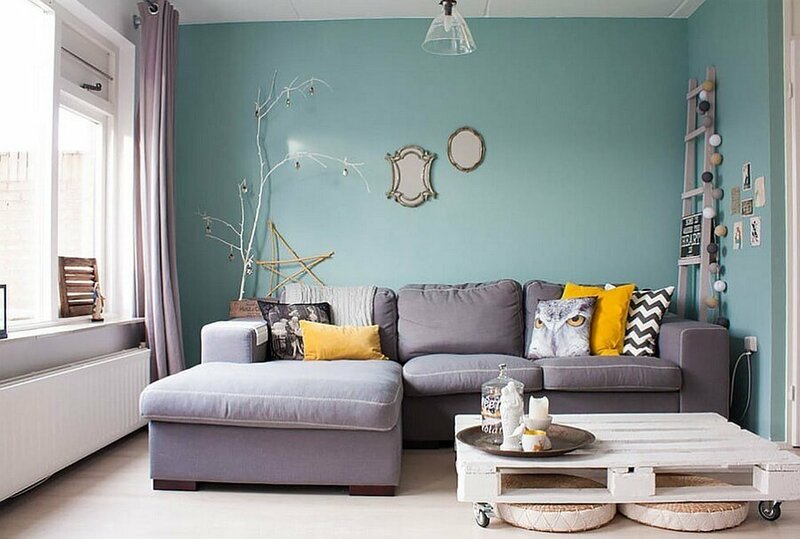 The pastel colors and clean foundation of this living room creates a gorgeously sleek and soft ambiance. The entire setting here is stunning. The pink curtains break through the white walls and provide a perky and sweet feel. The chandelier and lighting fixtures make the whole room a little bit more elegant without being too overbearing. This room is absolutely full of adorable country-vintage charm. 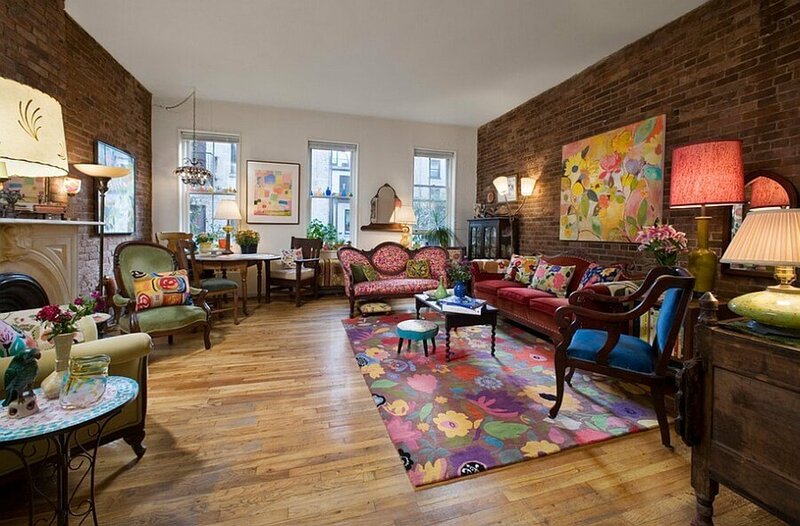 The dim color scheme with pops of turquoise and pink create an utterly charming and profound ambiance. The grey area rug in this living room just looks so incredibly soft! It makes quite a cool statement along with the creamy color scheme and classic design. Everything here is so peaceful and tranquil yet still looks very interesting to the eyes. 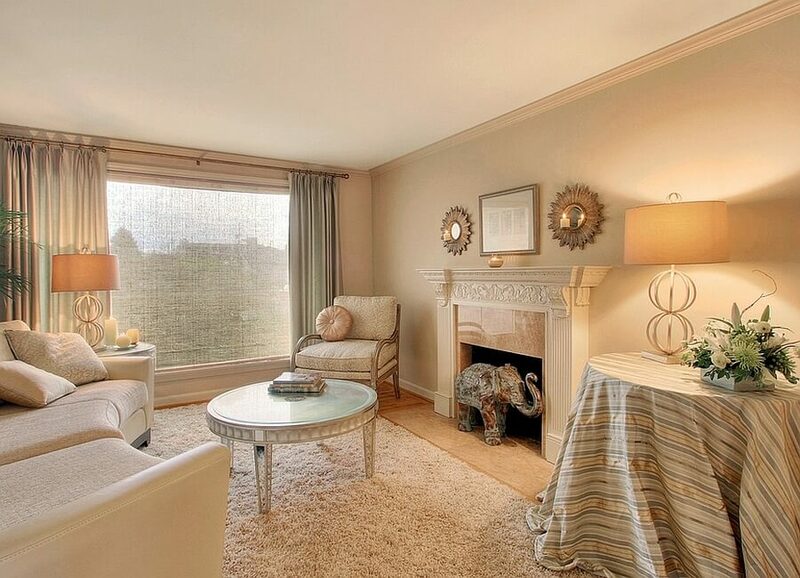 Theres some very interesting use of shapes here too from the pyramid shaped lamp to the coffee table. This room is just outstanding. There are so many patterns and colors applied to a plain white color scheme creating a superb and whimsical appearance. The photo on the wall is super unique and you can never go wrong with a zebra rug on the floor. You wouldn’t normally think that so many colours and patterns could work this well together but in this case they do!